RNA-seq and single-cell genomic research emerge as an important research area in the recent years due to its ability to examine genetic information of any number of single cells in all living organisms. The knowledge gained from RNA-seq and single-cell genomic research will have a great impact in many aspects of plant biology. In this review, we summary and discuss the biological significance of RNA-seq and single-cell genomic research in plants including the single-cell DNA-sequencing, RNA-seq and single-cell RNA sequencing in woody plants, methods of RNA-seq and single-cell RNA-sequencing, single-cell RNA-sequencing for studying plant development, and single-cell RNA-sequencing for elucidating cell type composition. We will focus on RNA-seq and single-cell RNA sequencing in woody plants, understanding of plant development through single-cell RNA-sequencing, and elucidation of cell type composition via single-cell RNA-sequencing. Information presented in this review will be helpful to increase our understanding of plant genomic research in a way with the power of plant single-cell RNA-sequencing analysis. The online version of this article ( https://doi.org/10.1007/s11676-019-00933-w) contains supplementary material, which is available to authorized users. RNA-seq and single-cell analysis in the scale of genome-wide represents an important research field of plant genomics research in the recent years because the transcriptomic data of thousands of single cells can be investigated in any specific plant species with this technology (Hedlund and Deng 2018). A large number of valuable knowledge have been gained from RNA-seq and single-cell genomic studies and these knowledge increase our understanding of life science, such as a better understanding of molecular mechanism of disease development, host–pathogen interactions, cell lineage relationships, cell type composition, disease evolution, and mosaicism of somatic tissues (Grun and van Oudenaarden 2015; Hodzic 2016; Ziegenhain et al. 2017). Single-cell genomic analysis facilitates the identification of molecular mechanisms involved in cell differentiation and embryogenesis (Grun et al. 2015; Picelli 2017; Ziegenhain et al. 2017). Single-cell genomic analysis examines the DNA or RNA sequence information of individual cells through optimized and powerful sequencing technologies for investigation of function of single cells in a specific plant species (Grun et al. 2015; Hedlund and Deng 2018; Picelli 2017). Single cell sequencing as a promising method for elucidating a set of important biological questions includes single cell DNA sequencing, single cell DNA methylome sequencing, and single-cell RNA sequencing (Grun and van Oudenaarden 2015; Hodzic 2016; Picelli 2017). Single cell DNA sequencing has been used in many organisms and one of the single cell DNA sequencing is multiple displacement amplification (Hane et al. 2014; Offermann et al. 2015; Utturkar et al. 2016; Yuan et al. 2018). Single cell DNA methylome sequencing quantifies DNA methylation and the popular method used for single cell methylome sequencing is whole genome bisulfite sequencing (Liu et al. 2018; Wuest et al. 2013; Yuan et al. 2018). Single-cell RNA sequencing shows profiles of gene expression in individual cells. Single-cell RNA sequencing can be used to identify rare cell types within a heterogeneous cell population through gene clustering analyses. The procedure of single-cell RNA-seq includes isolation of single cell, reverse transcription of RNA, amplification of cDNA, library generation, and sequencing (Hedlund and Deng 2018; Picelli 2017; Ziegenhain et al. 2017). In this review, we overview the biological significance of single-cell genomic research in plants including the single-cell DNA-sequencing, single-cell RNA-sequencing, single-cell RNA-sequencing methods, single-cell RNA-sequencing for studying plant development, and single-cell RNA-sequencing for elucidating cell type composition. We will focus on methods used for single-cell RNA-sequencing, understanding of plant development through single-cell RNA-sequencing, and elucidation of cell type composition via single-cell RNA-sequencing. Information presented in this review will be helpful to enhance our understanding of plant genomic research in a way with the power of plant single-cell RNA-sequencing analysis. Sequencing technologies have strong impact on single-cell DNA-sequencing in plants. Single-cell DNA-sequencing has great potential to gain insights into functions of genes in single plant cells. Applications of single-cell DNA-sequencing will be an important field in plant genomic (Yuan et al. 2018). In rice, genome-wide bisulfite sequencing revealed that OsROS1-mediated DNA demethylation restricts the number of aleurone cell layers in (Liu et al. 2018). Single cell DNA-seq has been applied in different plant species and the procedure of single cell DNA-seq includes; (1) isolation of single cells; (2) amplification of cDNA; (3) construction of cDNA libraries; and (4) sequencing of the cDNA libraies (Brandt et al. 2002; Offermann et al. 2015; Yuan et al. 2018; Zheng et al. 2016). Single cell DNA-seq has been reported in species of Populus trees and results derived from analysis of each single-amplified genomes demonstrated that single-cell genomics would facilitate future cultivation attempts (Utturkar et al. 2016). Single amplified genome can be used in microbiome studies that related to interaction between bacteria and Populus trees and this method is very helpful in obtaining genomic data from tree associated uncultured microorganisms (Hane et al. 2014; Liu et al. 2018; Utturkar et al. 2016). Single cell DNA-seq can provide insights into biological significance of cell development, differentiation, and responses to abiotic stresses. Gene expression studies of single cell will gain insights into our understanding of cellular function identification or communication among individual cells in plants (Wuest et al. 2013). Single cell DNA-seq is popular method that has been used for single cell genome sequencing in different species and application of this method has been reported in various areas including microbial genetics, plant molecular biotechnology, and plant pathology investigation (Hess et al. 2011; Libault et al. 2010; Pang et al. 2009; Wuest et al. 2013). Different genome assembly tools including IDBA-UD, Cortex and HyDA have been used for investigation of single cell genome sequencing. Multiple displacement amplification has been reported to be able to amplify femtograms of DNA from single cells for sequencing and reactions of multiple displacement amplification enable to synthesize multiple copies from each template DNA (Brandt et al. 2002; Hess et al. 2011; Libault et al. 2010; Pang et al. 2009). Single-nucleotide polymorphisms (SNPs) and copy number variation (CNV) are two fields that are difficult to apply in single cell sequencing because the DNA derived from a single cell is limited (Libault et al. 2010; Offermann et al. 2015; Wuest et al. 2013). The low amounts of DNA decrease accurate analysis of DNA amplification and cause low coverage and susceptible to errors. Single cell genomic approach has been widely applied on different types of microbiomes that are important in investigating microbial ecology, evolution, public health and biotechnology. Single cell DNA-seq is particularly useful for cancer investigations because single cell DNA-seq can be used to examine the depth of complexity and compound mutations in cancer cells. Single-cell DNA-seq can be used to analyze single nucleotide changes and copy-number variation of single cells, as well as to identify gene expression dynamics of single cells. RNA-seq and single-cell RNA-sequencing investigations have been applied in investigating function of cells in many plant species. Using RNA-seq, 170,844 transcripts and 40,644 Open Reading Frame (ORF) have identified in Arabidopsis calli. The results demonstrated that 62 genes were differentially expressed and 50 of them were up-regulated via response to auxin and cytokinin (Cervantes-Perez et al. 2018). Using RNA-Seq data, a litchi type II metacaspase gene, LcMCII-1, that is responsive to ROS, has been identified. LcMCII-1 is positively involved in the regulation of rudimentary leaf senescence in litchi (Wang et al. 2017). In the rubber tree (Hevea brasiliensis), the results derived from RNA-seq analyses demonstrated that SWEET2, 16, and 17 might represent the main direction of evolution of the SWEET genes in plants (Sui et al. 2017). RNA-seq analyses have been applied in coniferous species. In Norway spruce, nine mRNA libraries have been analyzed by RNA-Seq and more than 10,000 genes were identified to be involved in formation of the epigenetic memory (Yakovlev et al. 2016). In salt tolerant common bean, 155 basic helix-loop-helix (bHLH) protein-encoding genes were identified by comprehensive genome-wide analysis of bHLH transcription factors (PvbHLH) by using in silico comparative genomics tools and 100 PvHLH genes targeted by 86 plant miRNAs (Kavas et al. 2016). Different de novo assemblers including CLC, Trinity, SOAP, Oases, ABySS and NextGENe have been used for RNA-Seq data analysis of the plant transcriptome (Honaas et al. 2016). In H. brasiliensis, a large number of sequence data have been produced from RNA-seq projects and HbEBP1, a gene enable to increase both biomass and abiotic stress resistance, has been identified from these data (Cheng et al. 2016). RNA-Seq technologies have been used in analyzing gene co-expression network in plant and tree species for facilitating biological insight (Paul et al. 2014; Sundell et al. 2015). Using both cDNA/EST and RNA-Seq data, 9,473 NAGNAG motifs were observed in samples derived from pathogen-infected yissues (Shi et al. 2014). In the following sections, we summary the progress obtained from RNA-seq and single RNA-seq in woody plants (Electronic supplementary material Table S1). Apple is a very important fruit species in the world. RNA-seq technologies have been used to identify specific genes that are economically important in apple. For example, the 91071-gene, a 2-oxoglutarate-dependent dioxygenase gene, is identified to be involved in formation of short internodes (Okada et al. 2016). RNA-seq technologies have been used for virus identification such as recombination analyses of 21 viral genomes identified six recombination events from Apple stem grooving virus and in silico analyses of RNA-seq data reveal valuable information related to viral genome assembly, SNVs, and phylogenetic relationships of genetic recombination events (Jo et al. 2016). In apple, 1301 fruit acidity associated genes have been identified from RNA-seq data analysis and 18 of them were the most significant acidity genes that provided very important insight into gene network controlling acidity in apple fruit (Bai et al. 2015). Apricot (Prunus armeniaca) is an important woody plant species and a popular fruit tree species. More than 18 GB raw data have been obtained from P. armeniaca using RNA-seq technology and results derived from de novo transcriptome assembly demonstrated that 199,736 transcripts and 240,009 proteins were identified (Jo et al. 2015a). Information obtained from transcriptomes of P. armeniaca cultivars by RNA-Seq will be valuable in molecular breeding of this woody tree species. Beech (Nothofagus nervosa) is an economically important tree species in temperate forests. A total of 111,814 high-quality reads and 21,881 unique singletons have been obtained from analyses of RNA-Seq data of the transcriptome of N. nervosa, and a large number of simple sequence repeat markers were also obtained (Torales et al. 2012). This RNA-seq data is the first report in N. nervosa that represents a unique resource for molecular genetic and genomic studies for discovering genes and genetic markers of interest involving in evolution, molecular breeding, and functional genomics. Citrus is very important worldwide for fruit production. Results of RNA-Seq data analysis in Citrus species showed that expression levels of ARF1, ARF8, GH3 and IAA4 genes were negatively correlated with the growth rate and the content of IAA hormone (Liu et al. 2017b), indicating that expression of genes involved in auxin signal transduction may regulate the hormone levels. RNA-Seq data analysis between blight and healthy root samples identified mechanisms associated with blight phenotypes, starch accumulation, and abiotic stress (Zhang et al. 2016). RNA-Seq data analysis has also used to determine mechanisms of fruit tree architecture, and to identify promising DNA markers (Okada et al. 2016). Both recombination analyses and in silico analyses of RNA-Seq data provide a useful application of plant transcriptomes related to viral genome assembly and recombination (Jo et al. 2016). Litchi (Litchi chinensis Sonn.) is an important tree species. RNA sequencing in L. chinensis identified 83,107 unigenes and 50,345 of them were exist public protein databases. These results were helpful in understanding mechanisms and metabolism of cold stress tolerance in litchi (Zhang et al. 2017). Based on the RNA-Seq data, a litchi type II metacaspase gene, LcMCII-1, was identified to response to reactive oxygen species (ROS). Results of silencing and over-expression of LcMCII-1 demonstrated that LcMCII-1 is related to regulate leaf senescence in litchi (Wang et al. 2017). RNA-sequencing was also used to investigate transcriptome-related gene networks that regulate development of inflorescence meristems in L. chinensis. A total of 73,117 unigenes were identified, of which 48 were related to development of inflorescence meristems and 59 were related to signal transduction, indicating a gene regulatory network involved in hormone signaling-related flower development (Lu et al. 2017). RNA-seq investigation on carbohydrates regulated root development in Arbuscular mycorrhiza identified 381,429 unigenes including 54,100 unigenes from L. chinensis and 33,120 unigenes unigenes A. mycorrhiza fungi. The transcriptome data showed that a large number of transcription factors including WRKY and bHLH families had novel functions in carbohydrate shortage of mycorrhizal roots (Shu et al. 2016). RNA-Seq has been used to investigate gene expression that related to interaction between Lasiodiplodia theobromae and peach (Prunus persica L.). A total of 20,772 genes were identified and 920 genes of them were related to pathogenesis that was involved in glycometabolism and jasmonic acid signaling, indicating that defense response-related gene expression contributed to the gummosis of P. persica induced by L. theobromae (Gao et al. 2016). Longan (Dimocarpus longan Lour.) is an economically important fruit tree species. Nine longan tissues have been analyzed by an RNA-seq based analysis. The results of gene expression analysis showed that expression patterns of the longan UBC genes contribute to their biological roles in longan (Jue et al. 2018). High-throughput RNA sequencing was used to investigate the control of flowering. A total of 77,509 unigenes have been identified to be associated with flowering and 107 flowering-time genes were identified and confirmed by qPCR, providing new insight into the molecular mechanisms that regulate flowering time in species of woody plants (Jia et al. 2014). RNA-seq can be used to identify exon–exon splice junctions and different splicing patterns from different samples (Wilks et al. 2018). In the slipper orchids (Cypripedioideae), results derived from RNA-seq data analysis showed the identification of mechanisms associated with genome evolution and transcriptomic data that were used to identify low-copy orthologous genes demonstrated that 775 single-copy nuclear genes should be valuable in future investigations of orchid evolution (Unruh et al. 2018). In fig tree (Ficus carica), transcriptomic and metabolomic of analyses RNA-seq data have identified genes and compounds that are associated with development of immature fruit, pathogenesis, and lignified trunks of F. carica, indicating that the expression levels of pathogenesis-related proteins were the highest in the latex of trunk and that the fruit also attract insect pollinators at younger stages after ripening (Kitajima et al. 2018). These results suggest a number of candidate transcription factors and signal transduction proteins be involved in development and pathogenesis in F. carica. RNA-Seq has been used to investigate sugar metabolism in Japanese plum (Prunus salicina Lindl.). Results derived from metabolomics and transcriptomic analysis of RNA sequencing data showed the identification of 11 important sugar metabolism-associated genes and demonstrated that the oxidative processes was associated with fruit ripening, supporting a relationship between sugar metabolism and fruit ripening behavior (Farcuh et al. 2017). RNA-Seq investigations and small RNA-Seq studies have been performed for plant virus identification. Results derived from 15 publicly available transcriptome libraries and silico analyses of these data have provided a valuable application of plant RNA-seq data in investigations associated with viral genome assembly (Jo et al. 2015b). In pear (Pyrus bretschneideri), a total of 103 WRKY TFs have been identified from the RNA-seq experimental data and qPCR results, and 33 of them were tandemly duplicated and 57 genes of them were segmentally duplicated, indicating that these genes are involved in the biological pathways associated with abiotic stress (Huang et al. 2015). Comparative analyses of RNA-Seq data derived from several plant species including P. bretschneideri demonstrated that RNA-Seq is a valuable method for investigating genome evolution in different plant species (Yang et al. 2014). The rubber tree, Hevea brasiliensis, is a commercially important species in several countries. The mitochondrial genome was compared to the contigs of the published rubber tree. Novel transcripts were found to cause cytoplasmic male sterility (Shearman et al. 2014). Results derived from de novo RNA-seq assemblies of 22 accessions of 18 plant species demonstrated that RNA-seq technologies facilitate not only genome research, but also accelerate molecular breeding in plants (Kang et al. 2014). Manchurian walnut (Juglans mandshurica Maxim.) is a commercially important species. RNA-seq was used to develop molecular markers for this species. A total of 99,869 unigenes were obtained and 39,708 of them were identified to be useful for investigations of population genetics, bio-diversity, and genetic variation and structure. Information obtained RNA-seq data will be useful for understanding the function of transcriptomes in J. mandshurica and other plant species (Hu et al. 2016). Comparative RNA-seq analysis in root tissues of olive (Olea europaea L.) has been used to identify molecular mechanisms involved in pathogenesis of virus infection according to their time-course expression patterns and the results demonstrated that tolerance of virus is a consequence of a complicated process that involved many mechanisms in plant (Leyva-Perez et al. 2018). In order to identify transcripts that are involved in the development of fruits and maturation, RNA-seq was used to examine the expression patterns of genes. A total of 103,359 transcripts were obtained and 3792 and 3064 were differentially expressed during 100–130 DAF transition, these results are valuable in investigations of metabolic processes and fruit pigmentation in O. europaea (Iaria et al. 2015). Sandalwood (Santalum album) is an economically important plant species in the world. RNA-seq technology has been used to examine gene expression and metabolic pathways involved in the development of S. album. A total of 56,011 contigs were obtained from de novo assembly of RNA-seq data derived from samples of seedling roots that are associated with morphogenesis in S. album and the obtained RNA-seq data will improve our understanding molecular mechanisms of root development in S. album (Zhang et al. 2015). In root cell populations, measurement of the gene expression among individual cells will be important for tissue function during root development. Poplar is an economically important woody tree species. Analysis of RNA-Seq data derived from tissue- specific libraries has identified millions of novel splice junctions and analysis of isoform sequencing also identified 15,087 novel transcribed regions, indicating that stress treatments can be related to coordinated switches between spliced and intron-retaining isoforms (Filichkin et al. 2018). Analysis of gene expression profiling in samples of poplar roots has identified 463 genes differentially expressed in roots under treatments of different concentrations of N, showing a better understanding of the mechanisms regulating root development (Qu et al. 2016). RNA-Seq technology has been used to investigate the cork developmental in hybrid poplar (Populus tremula × Populus alba) and 455 candidate genes that are responsible for the biosynthesis of poplar suberin have been identified (Rains et al. 2018). RNA-seq analyses have identified the involvement of PtSWEET16b and PtSWEET16d genes in xylem development of P. trichocarpa (Sui et al. 2017). RNA-seq analyses have also identified a large number of regulators that are was related to DNA and histone methylation (Yakovlev et al. 2016). In Chinese white poplar (Populus tomentosa), RNA-seq has been used to investigate the effects of salinity stress and some genes have been identified to play very important roles in salt stress response in poplar (Zheng et al. 2015). RAN-seq has been used to investigate wood formation in P. tomentosa. A total of 30,385 unique genes have been identified and they are related to flavonoid biosynthesis and cell wall metabolism (Chen et al. 2015). Although a large volume of RNA-seq data has been obtained, some challenges for ChIP-seq and RNA-seq experiments exist. Comparison between ChIP-seq and RNA-seq data will be valuable to RNA-seq network analyses (Liu et al. 2014). RNA-seq technologies are very important for genomic and pathogenic investigations in Eucalyptus tree species. To unravel molecular mechanisms involved in pathogenesis in Eucalyptus tree species, the genome of Calonectria pseudoreteaudii was examined and 1785 species-specific gene families in C. pseudoreteaudii have identified (Ye et al. 2018). In another RNA-sequencing study in Eucalyptus nitens, over 1400 genes were identified differentially expressed in inoculated trees and a number of pathogenicity factors have identified (Meyer et al. 2016). Using RNA-seq and qPCR, NAC domain genes have been identified in Eucalyptus grandis and 189 E. grandis NAC proteins are identified to be response for wood formation and development (Hussey et al. 2015). RNA-seq technology has been used to investigate the development and 38 E. grandis genes are identified to locate in bona fide lignification clades and 17 genes may be involved in lignin biosynthesis in E. grandis (Carocha et al. 2015). In E. nitens, 3953 transcripts have identified to be involved in biotic and abiotic stress response (Thavamanikumar et al. 2014). 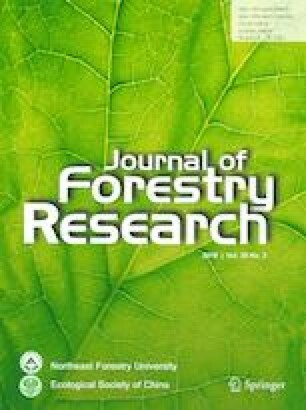 In Eucalyptus grandis and E. urophylla, integrated analysis of transcript and trait variation in eucalypt hybrids could be useful in investigation of wood property traits (Kullan et al. 2012). Oaks are very important tree species in the world. Pedunculate (Quercus robur L.) and sessile (Quercus petraea Matt. Liebl.) Oaks have different ecological characteristics. To identify genes important for adaptation to waterlogging, responses to waterlogging stress and its gene expression were investigated by RNA-seq and 3705 contigs were identified to be differentially regulated between the two species (Le Provost et al. 2016). RNA sequencing analysis have identified 578 gene trees that are related to the timing of the duplication events in the evolutionary history (Devos et al. 2016). Cork oak (Quercus suber L.) has been a very important forest tree species. RNA-seq analyses in Q. suber have identified a total of 80,357 expressed sequence tags and 7.6% of the total number of transcripts present in Q. suber transcriptome was identified as acorn specific during development (Miguel et al. 2015). Genomic and transcriptomic analyses tools would be valuable in investigation of the mechanisms of insecticide resistance and development (Jouraku et al. 2013). Neolamarckia cadamba is a very important tropical hardwood tree. RNA-seq analyses of the N. cadamba transcriptome have identified 55,432 UniGenes and 47.8% of the UniGenes have been annotated against publically available protein databases and 5589 UniGenes have been mapped onto 116 pathways (Ouyang et al. 2016). RNA-seq technology has been used to investigate xylogenesis in N. cadamba and the results derived from RNA-seq analyses demonstrated that genes related to heteroxylan synthesis had higher expression in the basal part of the stem compared to the apical part (Zhao et al. 2014). Willow (Salix matsudana Koidz.) is a very important deciduous tree species in the world. Analyses of both transcriptome and small RNAome data have identified 106,403 unique transcripts and 166 known miRNAs and these results provide valuable information for uncovering the stress response genes in S. matsudana, and will be helpful for future study of genetic resistance in Salix (Rao et al. 2014). Tree peony (Paeonia suffruticosa Andrews) is a very important woody plant species and a very famous traditional ornamental plant. RNA-seq amalyses have identified a total of 173,960 transcripts and 78,645 unigenes in P. suffruticosa and these genes are associated with the mechanism of regulation of flowering time in tree peony (Hou et al. 2018). In another study in P. suffruticosa, a total of 90,202 unigenes were obtained by de novo assembly and 6855 unigenes were identified to be differentially expressed between yellow and purple-red flower petals (Shi et al. 2015). In addition, the transcriptome change in petals of cut tree peony has been investigated and 173 differentially expressed genes were identified (Zhang et al. 2014). Champak (Magnolia champaca) is a well-known tree species with highly fragrant flowers. Analyses of RNA-seq and de novo assembly of champak flower transcriptome have identified 47,688 non-redundant unigenes and analysis of expression levels of many floral-scent biosynthesis-related unigenes in flowers and leaves demonstrated that most of them were expressed higher in flowers than in leaf tissues (Dhandapani et al. 2017). Chinese fir (Cunninghamia lanceolata) is a commercially important tree species and is widely distributed in southern China and northern Vietnam. Analyses of RNA-Seq data at the dormant, reactivating and active stages have identified a large number of regulators of cambial activity, cell division, and cell wall biosynthesis (Qiu et al. 2013). RNA-seq approach has also used to investigate the molecular mechanisms somatic embryogenesis in other woody plant species and the results suggest many gene families may contribute to the development and wood formation (Yakovlev et al. 2016). Aleppo pine (Pinus halepensis Miller) is one of the most drought-tolerant pine species throughout the Mediterranean basin. To determine the mechanisms that P. halepensis uses to withstand drought, transcriptome analyses was performed and more than 6000 differentially expressed transcripts were identified (Fox et al. 2018). Results derived from the drought-related transcriptome demonstrated dynamic response to drought in P. halepensis. RNA-seq technology has also been used in investigation of pine pest. For example, the mountain pine beetle (Dendroctonus ponderosae Hopkins) is a highly destructive pest of pine forests. RNA-Seq analysis has identified 13,407 potentially unique transcripts that could be valuable in the identification of molecular targets for the pest management (Nadeau et al. 2017). RNA-seq analysis has been used to identified genes related to defense responses against insects and fungal pathogens in Pinus species, a set of differentially expressed genes have been identified and 999 transcripts were down-regulated in needle tissues (Liu et al. 2017a). RNA-seq data have also provided information on enzyme-mediated limonene utilization (Wang et al. 2014) and information on host colonization by mountain pine beetle (Robert et al. 2013). Analyses of RNA-seq data have identified 8314 protein-coding genes that could be related to antimicrobial stress and suggest that the fungus may detoxify chemicals by using them as a carbon source (DiGuistini et al. 2011). Ginkgo biloba is one of the most ancient tree species and its codon usage pattern analysis is valuable to understand plant evolutionary. Analyses of RNA-Seq data derived from the G. biloba transcriptome have identified 17,579 unigenes (He et al. 2016). The predicted transcripts are encoding enzymes associated with the biosynthesis of diterpenoid and terpenoid compounds and the phylogenetic analysis has identified two terpene synthase genes as primitive genes that might have evolved from an ancestral diterpene synthase (Parveen et al. 2015). Haloxylon ammodendron (C. A. Mey.) is widely distributed woody plant species in Asian and African deserts. Analyses of RNA-Seq data have identified 79,918 unigenes that are related to drought stress responses in H. ammodendron and 25,619 unigenes were functionally related to abiotic conditions (Long et al. 2014). These results would be valuable for functional genomic studies of desert plants under abiotic stresses (Long et al. 2014). In another RNA-seq study in H. ammodendron, RNA-seq analyses have identified a total of 87,109 unigenes and 3353 of them were differentially expressed in shoots and 4564 of them differentially expressed in in roots (Gao et al. 2017). Ammopiptanthus mongolicus (Maxim. Ex Kom.) is a very important woody plant species and play important role in maintaining desert ecosystems. RNA-seq studies have provided insight into the mechanisms associated with drought tolerance of A. mongolicus. The differentially expressed transcripts identified from RNA-seq data provide valuable information for identifying the key genes in stress response (Gao et al. 2015). Catalpa bungei is an important deciduous tree native to China. Microsatellite markers have been obtained in C. bungei and used to investigate its population genetics via RNA-seq and all markers showed good amplification results (Wang et al. 2016). In another RNA-seq study, 47,111 transcripts have been identified and 7330 differentially expressed transcripts were related to abiotic stress tolerance, suggesting that the RNA-seq dataset was valuable to analysis of gene expression pattern (Xiao et al. 2016). The paper mulberry (Broussonetia papyifera) is a very important multifunctional woody plant species in the world and is commonly utilized in traditional medicine in Asian countries. Analyses of RNA-seq data have identified 627 transcription factor genes that exhibit the differential expression profiles in root (Peng et al. 2014). RNA-seq technology could be considered as a cost-effective method for functional genomic investigation in woody plants (Moazzam Jazi et al. 2015). Platycladus orientalis is a very important tree species with lifespans of thousands of years. RNA-seq combined with a digital gene expression technique was used to assess the stability of gene expression in samples derived from different developmental stages and under different stress conditions. The results were valuable to research on the expression of genes in response to stress and senescence in P. orientalis and other plant species (Chang et al. 2012). Prosopis alba is an important tree species in north-western Argentina which is of great value as multipurpose species. Analyses of RNA-seq data in P. alba have identified a total of 39,000 unique singletons that would potentially contribute to the population-based genome studies in the genera (Torales et al. 2013). Kang et al. obtained 1709 single-copy orthologs genes from analyzed species through RNA-seq data analyses and four-cluster likelihood mapping was used to study potential incongruent signals (Kang et al. 2017). Xanthoceras sorbifolium is an economically important tree species and an important biodiesel crop. Analyses of RNA-seq data have identified 274 genes expressed specifically in the selfed ovules and 42 genes significantly up-regulated in the crossed ovules. These results represent an important genome-wide identification of genes expressed in the fertilized ovules of X. sorbifolium (Zhou and Zheng 2015). Single-cell RNA-sequencing methods describe the techniques that represent the promising high-throughput approaches that are used in investigation of single cell function. Single-cell RNA-sequencing methods include full-length RNA-sequencing methods, Array-based and emulsion-based methods, CytoSeq method, Drop-seq & InDrop methods, and single-cell tagged reverse transcription sequencing (STRTseq). Full-length RNA-sequencing methods are the widely used single cell RNA sequencing approaches. Full-length RNA-sequencing methods include: (1) Tang method that is the first scRNA-seq method developed by the Surani lab; (2) Smart-seq and Smart-seq 2 that are developed by the Sandberg group; (3) Quartz-seq that is improved version of the Tang method; (4) CEL-seq, CEL-seq 2 and MARS that are Tag-based sequencing methods. Both array-based and emulsion-based approaches are new generation single cell approaches that can be scaled up and utomatized, as well as increase the efficiency. CytoSeq method that was first published in 2015 and was widely used in investigation of gene expression profiling of individual cells. Drop-seq & InDrop methods are imilarly to CytoSeq, but the methods carry out all the reactions in nanoliter volumes. Single-cell tagged reverse transcription sequencing (STRTseq) method is developed by Sten Linnarsson’s group uses an anchored oligodTprimers for reverse transcription. Preparation of cDNA library is very important for every single single-cell RNA-sequencing methods. The samples have to be prepared using an additional library preparation step that is suitable for sequencing on the Illumina. For example, for spatial transcriptomics study of solid tissues and organs, the first step is to isolate single cells (Picelli 2017). Recently, Ziegenhain et al. (2017) have evaluated six prominent scRNA-seq methods: CEL-seq 2, Drop-seq, MARS-seq, SCRBseq, Smart-seq, and Smart-seq 2 (Ziegenhain et al. 2017). Their results demonstrated that Smart-seq 2 was the most effective approaches for RNA-seq and this method provides a framework for future improvements of scRNA-seq methodologies (Ziegenhain et al. 2017). Single-cell RNA sequencing is able to obtain genetic information from single cells in any organisms where each cell is unique. Single-cell RNA sequencing has emerged as an indispensable tool to dissect the cellular heterogeneity, which offers enormous potential for de novo discovery of cell function, cell interaction, and variation (Junker and van Oudenaarden 2015; Wu et al. 2016; Picelli 2017). Single-cell transcriptomics are promising and single-cell RNA sequencing is playing increasing role in biology and further improvement will provide spatial information and coupling to other cellular modalities that will greatly benefit biological research (Ziegenhain et al. 2017). Single-cell RNA-seq technologies have been utilized for understanding interaction of cells. Combination of single-cell genomics with single-cell proteomics plays important roles in fields including cell biology, functional genomics, and infectious disease (Hedlund and Deng 2018). The potential of single-cell in different research fields is very high and more effectively, compared to traditional approaches and advances in study of genome amplification in single cells offer opportunity to investigate unique genomic structure (Grun et al. 2015; Grun and van Oudenaarden 2015; Hodzic 2016; Hedlund and Deng 2018). Single-cell RNA-seq technologies are very valuable for exploring biological systems with unprecedented resolution and investigation the genome of individual cells is helpful to understand mechanisms of clonal dynamics and somatic mutations (Hodzic 2016). Data analysis of single-cell transcriptome is a very important part of single-cell sequencing investigation. The procedure of single-cell transcriptome analysis includes the following steps: (1) Data preprocessing and read mapping; (2) Expression quantification and filtering; and (3) Data normalization. Biological significance and application of single cell RNA-seq technologies includes: (1) Identification of cell types in any organisms; (2) Identification of specific biomarker genes for better characterization a cell type; (3) Characterization of differentiation dynamics and differentiation pathways; (4) Investigation of biological gene expression variation and transcriptional dynamics in a population of cells; and (5) Identification of single-nucleotide polymorphisms. Advances in single cell RNA-seq technologies have been valuable to single-cell genomic analysis and the research field of single-cell plant functional genomics could be lead to gain insights in understanding complicated molecular interactions in plants. The approaches of single-cell plant genomic analysis and applications of single-cell genomics could be result in rapid development of plant genomics and biology (Grun and van Oudenaarden 2015). Single-cell RNA-sequencing is emerging as a novel approach to investigate plant development. Single-cell RNA-seq is able to provide high-resolution variation measurements of different cell types (Fig. 1). Single-cell RNA-seq has been widely used in human and medicine studies and has applied in model plant species. Single-cell RNA-seq is a very useful tool to identify gene expression dynamics among different cell populations. Plant tissues and cells are biochemically and physiologically specialized. It has been reported that developmental stage of leaf and the intensity of light could be affect the ion and metabolite distribution in individual cells in barley (Fricke et al. 1994). This work presented as good example of single-cell analysis with two purposes including: (1) individual cells at different developmental stages are physiologically different; and (2) individual cells could be differential response to stimuli of light and nutrition. In addition, gene expression maps of roots have demonstrated that expression patterns in cells were not always correlated with anatomical boundaries (Birnbaum et al. 2003; Brady et al. 2007). Single-cell RNA-sequencing is very valuable in identifying rare transcripts expressed in specific types of cells in plants. It has been reported that enrichment of DNA repair events and chromatin modification pathways individual cells play important roles in maintenance of genome stability and affect cell function (Yadav et al. 2009). In Hevea brasiliensis, RNA sequencing data provides genetic information in whole-genome including gene functional annotations, genome wide transcription start sites identification, and characterization of functionally related gene sets regulated by transcription factors (Makita et al. 2018). In Nicotiana attenuate, a transcriptomic atlas based on 20 RNA-seq expression profiles could be used for predicting the functions of genes. These data can facilitate rapid gene discovery, as well as comparative genomic analysis (Brockmoller et al. 2017). In switchgrass (Panicum virgatum), analyses of RNA-Seq datasets identified a large number of WRKY genes and demonstrated that 23 WRKYs were involved in leaf senescence, indicating the WRKY genes could be hotspots of related senescence-associated genes (Rinerson et al. 2015). RNA-Seq data analysis of 16 Flaveria species showed that RNA-seq data could be used to construct robust trees for functional investigation (Lyu et al. 2015). In Schima superba and Cryptocarya concinna, analyses of RNA-seq data indicate that the amount of phenolic compounds play important role in photoprotection (Zhang et al. 2018). Pterospermum kingtungense C.Y.Wu ex Hsue is a very important limestone specific tree species. Analysis of RNA-seq data has identified 50,333 transcripts that are associated with limestone adaption and excellent wood properties (Ren et al. 2017). RNA-seq technology has been used to investigate the genetic control of flower size differences and identified that a large number of transcripts were differentially expressed during flower development (Landis et al. 2017). In Quercus suber, a total of 962,172 high-quality reads have been obtained through RNA-seq and analysis of these data has identified many differentially expressed genes that were involved in the development of male and female flowers (Rocheta et al. 2014). Development of the meristem produces diverse pattern of leaf within a plant. In Gevuina avellana, interaction between the light environment and the heteroblastic progression of leaves was investigated using RNA-seq technology and analysis of the RNA-seq data demonstrated that different gene expression was associated with increases in age, leaf complexity, and light availability (Ostria-Gallardo et al. 2016). Novel biomarkers are important for detection of growth, development, and disease resistance. Single cell RNA-seq is valuable to elucidate cell type composition through identification of transcripts and biomarkers; for example, methylated genomic locations could be used to build the model for disease detection (Sun et al. 2017). RNA next-generation sequencing could be used to characterize patterns of miRNAs and comprehensive profiling of miRNA transcriptome will provide to be useful for further functional validation and biomarker identification (Gecaj et al. 2017). Transcriptomic analyses of the disease line and of the normal tissue will offer unprecedented opportunities to investigate mechanisms underlying pathogenesis (Oikawa et al. 2015). Fruit yield derived from breeding improvement is important for horticultural plants. In Camellia chekiangoleosa, a total of 140,299 unigenes were identified using RNA-seq technology, and twelve identified transcription factors were identified to be related to inflorescence development and hormone signaling, indicating that a potential link exists between fruit count and its oil yield (Xie and Wang 2018). Verticillium wilt of olive (VWO) is one of the most serious biotic constraints for this tree crop. A comparative transcriptomic analysis (RNA-seq) of root tissues of cvs Frantoio (VWO-tolerant) and Picual (VWO-susceptible) demonstrated that different expression levels exist in pathogenesis-related protein and reactive oxygen species stress response unigenes, showing that a complex and multifaceted process were associated with plant traits (Leyva-Perez et al. 2018). RNA-seq and single-cell RNA-sequencing technologies are very importance in answering biological questions in the field of biology and medicine. 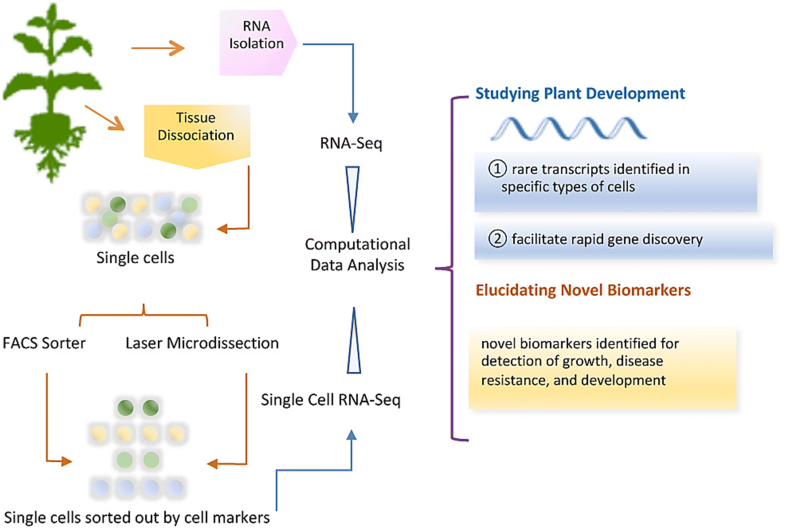 RNA-seq and single-cell RNA-sequencing technologies will be also valuable in plant science as a method to characterize cell types and investigation of single-cell genomes could be helpful for scientist to understand sophisticated interactions and signal transduction among individual cells (Fig. 1). Although technical challenges exist in single-cell sequencing, available approaches, experimental design, and single-cell data analysis could be valuable for researchers to investigate functions of cells. The RNA-seq techniques and applications of single-cell sequencing experimental designing summarized in this review will be helpful for future analysis of single-cell transcriptomics in woody plants.